It’s common knowledge that you need a good pair of running shoes. But your search for decent footwear shouldn’t end there. 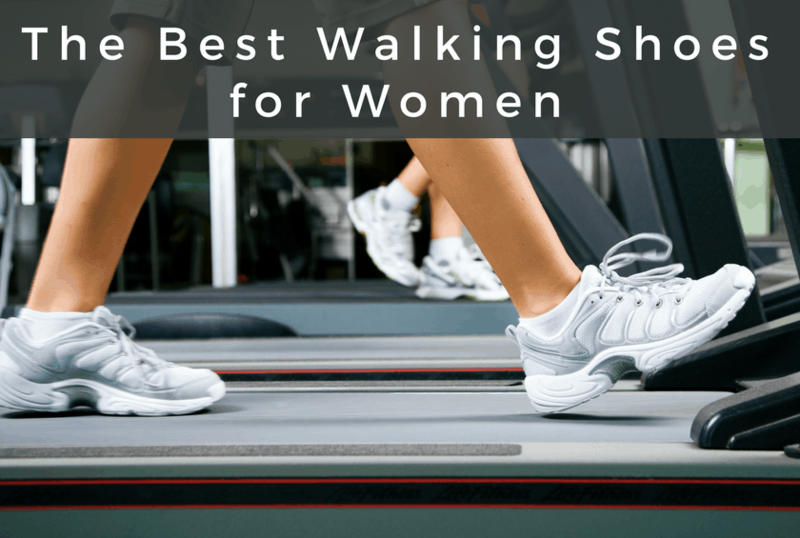 It’s just as important to invest in good walking shoes as it is for other types of shoes. After all, pain-free walking is priceless. It’s easy to get overwhelmed with all the shoes out there. Our guide will run through some of the best ones on the market along with the pros and cons to help you make an informed choice. Remember that you should replace them every 500 miles. And if you are interested in the best walking shoes for men, check out this article. The Ryka Devotion Plus 2 is an update from the manufacturer’s Devotion Plus model. It took an already comfortable shoe and made it better. It’s all about a good fit with its Lyca tongue and cushy heel collar to prevent blisters on your ankle. The design of the shoe is spot on with its full-length internal insert and cushioning insole. The traction is great too. It’s lightweight and feels good out of the box. The breathable mesh is always welcome for those summer treks. 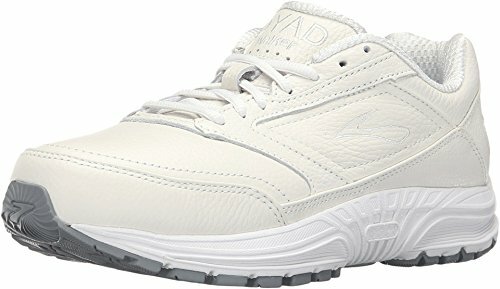 Ryka markets these shoes as a feminine model which is obvious with the color choices. For our part, they are brighter than we’d prefer. 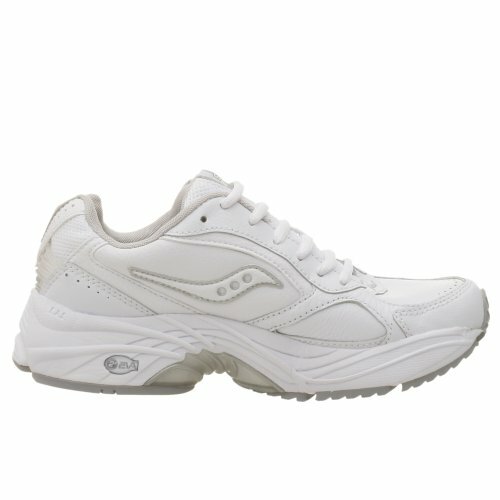 But for an all-around walking shoe, you can’t go wrong with this pair. 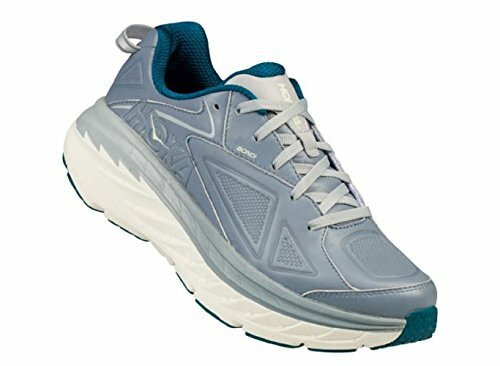 The Hoka One One Bondi LTR is one of the best walking shoes for women if you like a lot of cushioning. It’s a pair that you can easily use for running too because of the support. It has a rocker style which can see in the profile. This allows for a smoother, more efficient ride. The extra cushioning is great if you suffer from knee or hip pain. The extra support is a godsend if you need that in a shoe. However, it comes with tradeoffs in ground feel and responsiveness. That may prove to be a dealbreaker for some who prefer a more natural experience when walking. There’s a lot going on with this pair of shoes. You will feel noticeably taller when wearing them. That’s a good thing if the path is sloppy. The shoes aren’t cheap, but you’ll get your money’s worth. That said, they’re not necessarily a shoe for everyday use but excel on walks, especially if you go out for longer distances. The Brooks Addiction Walker succeeds with a pair of shoes that will make you want to get outside. The cushioning is excellent throughout the construction. The product strikes a nice balance between comfort and stability. The shoes fit true to size and come in widths which we always like to see. You can choose between four different widths to ensure a good fit. They are a bit on the pricey side, but they’re a pair you can wear every day. Walking in them feels natural and won’t change your stride. This pair stands out because it is also doctor recommended for those who have foot issues. You can easily slip in your orthotics for a better fit. We liked its clean, classic profile. Props for making an eco-friendly product! The Saucony Grid Omni Walker is a good-looking shoe made with both synthetic materials and leather which makes it an affordable option. It features plenty of cushioning in the tongue and opening which provides excellent stability. The midfoot support is great too. 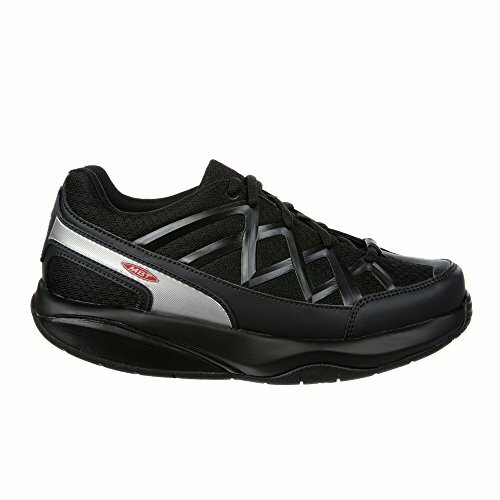 It’s a comfortable shoe to wear walking that can double as an all-purpose pair for everyday use. The design allows for a smooth walking pace that feels natural. Unlike many products, these shoes do not have mesh. They are an excellent choice if you need some extra arch support, especially for easy runs. They’re lightweight and won’t contribute to fatigue. They’re not the cheapest product out there, but you will get your money’s worth. The New Balance 877 differs from our other picks with a suede and mesh design. It has a sleek profile that looks and feels good. We liked the fact that the insole is removable which is a good thing since some may find the arch support inadequate. The cushioning is moderate for those who prefer more ground feel. That said, you’ll feel it if you routinely walk on rougher surfaces. It’s not the pair you want to wear for long stints walking on concrete without swapping out the insoles. 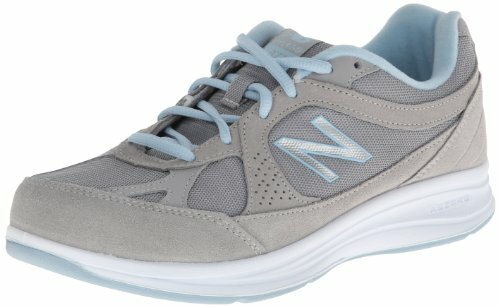 The shoes are affordable which is what we’d expect from New Balance. For the money, it’s a good value. They’re breathable with welcome airflow. The upper is leather while the sole is rubber. The Hoka One One Valor LTR stands out as one of the most expensive shoes we’ll review. But that’s to be expected from a manufacturer who shines as one of the best in the industry. This pair is an excellent choice for walking on roads and light gravel – even the occasional run. It has a generous amount of cushioning along with great support throughout its design. It’s best suited for individuals with medium to high arches. It is a maximalist shoe which some may or may not like. It will reduce ground feel with the advantage of added comfort from loads of cushioning. They have a rocker style feel to them but not in an overt way as in some shoes we reviewed. They’ll work well for someone who doesn’t need extra arch support. You can easily use them for easy runs on pavement or light gravel surfaces. 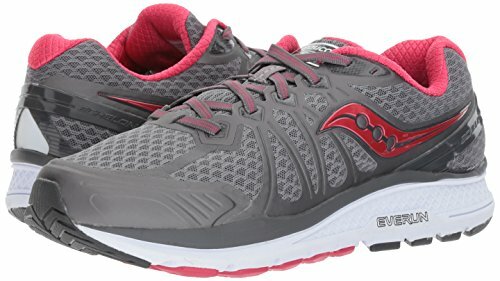 The Saucony Echelon 6 is a departure from other shoes we considered with its lower profile that will strike a chord with some users. The back of the collar doesn’t ride up very far which some may prefer. Nevertheless, the cushioning makes for a comfortable shoe. They are roomy in the toe box with enough space to accommodate orthotics if you have them. However, they are well suited for people that don’t need anything extra in arch support. The construction is top quality. It’s a well-made product that justifies the higher price tag. 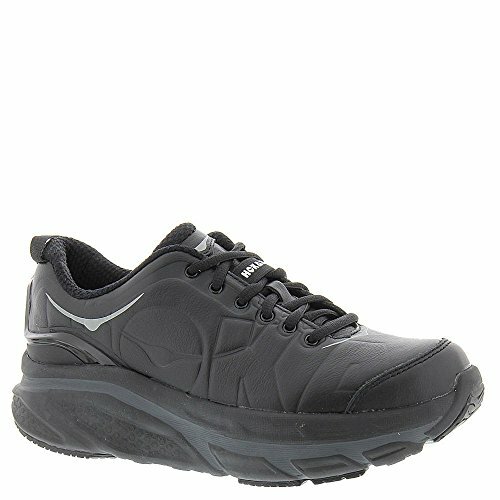 Overall, these lightweight shoes are durable and able to handle walks on smooth to light gravel surfaces. You’ll find them in both standard and wide widths – although the standard width is still quite wide. Those with narrower feet might find them a tad too big. 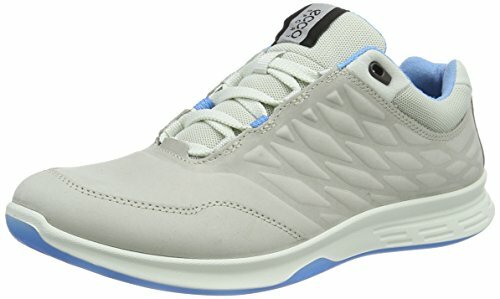 The Ecco Exceed Low is the only shoe we considered that is made of a yak leather upper. There is also breathable textile which gives it good airflow. They look sleek. We liked the profiles of these shoes. They come in a decent selection of colors too. There is a generous amount of padding on the collar and tongue of the shoes. There’s also plenty of room in the toe box which is essential for our part. We’re not big fans for the texturing on the upper or sole of the shoe, but it’s a minor point. The two-toned colors were a bit odd too. From a practical perspective, they have ample support for a decent pair of walking shoes that won’t break the bank. They provide reliable traction and have plenty of padding for a comfortable everyday shoe. They’re quite flexible with good ground feel and responsiveness. The Brooks Dyad Walker is a well-made shoe that we’d expect from Brooks. It has a great amount of cushioning and support, yet it is still responsive with good ground feel. It’s an excellent choice for walking or easy runs on smooth pavement. It has a lower profile than some others we considered. In no way does that skimp on comfort. It’s a good-looking shoe that offers reliable stability. They are lightweight though a tad shallow in the heel and narrow in the toe box. Products from Brooks aren’t cheap. 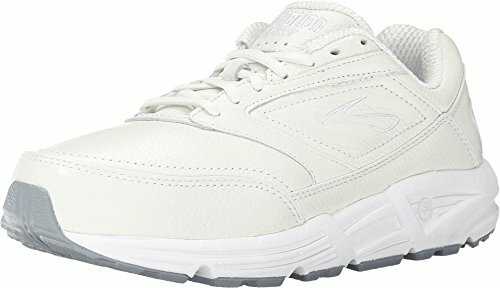 It’s a higher end pair that still qualifies as one of the best walking shoes for women. They are something that is made to last. They also take an orthotic very well, if you need one. The MBT Sport 3 isn’t for everyone. It has a rocker style with a maximalist construction that may turn off some users. However, if you like that type, it’s worth a look. The manufacturer bills its sole structure as similar to walking barefoot. The design will change your stride. The updated version is a bit heavier and narrower in the toe box than previous renditions which is disappointing. On the positive side, they are roomy even if you have wider feet. The cushioning is top notch for comfortable wear. The shoes are synthetic which keeps the cost in line. They’re worth considering for budget-minded folks in need of a decent all-around pair.